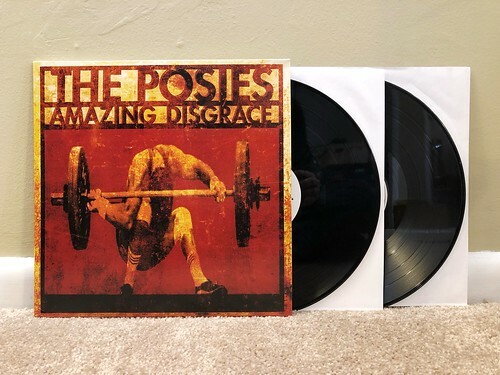 Amazing Disgrace is the third Posies vinyl reissue that was released by Omnivore as part of their Pledge Music campaign. It was the final one to arrive (which makes sense chronologically) and is also the Geffen album of theirs that I am least familiar with. I've never actually owned this album previously and only really know the songs that were featured on the Dream All Day best of CD that I've had for about twenty years. I don't really have a good reason as to why I've never bought it, I also don't have their first album Failure that they rereleased on vinyl a couple of years ago. I should pick up that one too, eventually. What I can say is that Amazing Disgrace is an incredible album. The songs are just as strong as anything on Frosting On The Beater, though they hit me a little differently since I don't have the twenty years of nostalgia coloring the way I feel about everything. One of the things that the Posies to better than almost anyone are the way Jon Auer and Ken Stringfellow blend vocal harmonies into their fuzzy guitar rock. I can't think of a band that is their equal when it comes to that and all you need to do is listen to opening track "Daily Mutalation" as proof. From there, the songs that I seem to like the most are the ones I've heard before like "Throwaway" and "Ontario." That said, I think it might be my preexisting familiarity with these that make them stand out, because everything on this album is pretty damn great. I'm happy to finally have this whole album and on a nicely reissued double LP to boot. It's probably time to track down Failure next.